If you are looking for information on the The Painting Pros franchise business opportunity, The Painting Pros franchises or The Painting Pros franchising, then you have come to the right place. 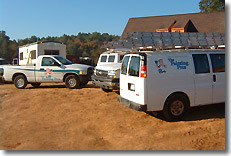 The Painting Pros was founded in 2003. Our focus is on residential, commercial, industrial and new construction painting. Our strategy has been built upon targeting middle to high income consumers as well as National and Regional commercial accounts with Companies like The Home Depot, Marriot, Holiday Inn, Gap and Banana Republic. We have built these relationships through our Company owned stores and intend to continue to expand these relationships through our franchise system. We use the slogan "America's Painting Company" because we intend to become the largest and highest quality full service painting Company in the United States. This vision will be achieved through the determination and hard work of all our employees and franchisees. To that end, we have developed a franchise system based upon our proven Company business model that is constantly refined through research and development and by encouraging new and innovative ideas. "A Day in the Life of a Painting Pros Franchisee"
Our franchisees are not alone in their business they manage a system and a team. They start their day by checking in with their team and managing a Step by Step system that is proven and easy to follow. We provide a complete software package that helps streamline their business operations from tracking leads, to estimating jobs and right on to customer follow up and accounting. This allows the franchisee to know what is going on in his and her business every morning from their home, their office or a beach in the Caribbean. You see, our system is web based and allows them to have real time data at their fingertips from any internet connection. After the franchisee get's briefed from the team, we want them to be the face of their business. They do not get up on the ladder or ever hold a paint brush in their hands, they do what they are good at and that is building relationships. So the rest of the day is spent networking at business meetings, meeting new contractors in the area and concentrating on managing a system. Our franchise system uses a combination of employees and contractors to sell the jobs, do the work, manage the operations and collect the payments. So after a day of being out and about and not stuck behind a desk or in an office, the afternoon is spent by having a sales meeting with your team, training and teaching them the system and managing customer callback sessions. The software helps keep track of the scheduling too so you know what is on the agenda for tomorrow. This also allows the franchisee to manage multiple locations like we do with our Company stores. Our perfect franchise candidate is someone who has been stuck in middle management and wants to get out and own their own business. We are not selling a "get rich quick" scheme but a solid business model. We need someone who is willing to roll up their sleeves and work hard to get the business moving in their area. A Painting Pros franchise is for those who have management and sales experience as the franchise is built around managing sales people and experienced painters to do the work. We are not really looking for someone who wants to do this "part time" or work from home. We encourage large territories and multiple locations in which to grow and diversify your business as "full service" which includes: Residential, Commercial, Industrial and New Construction. The painting industry works much like a Stock Portfolio - you must be diversified in different aspects of the industry to adapt to ever changing market and economic conditions. So we are looking for a candidate who wants over a million dollar business and is not just happy with paying the bills. That is why we offer generous territory sizes to meet the needs of our growing franchisees. We work with each franchisee closely and want them to succeed but they must have a desire to succeed in order to be successful. 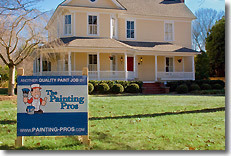 The Painting Pros has a proven business model that we have been refining for the past 6 years. It's built upon various marketing methods to generate leads, Total Workflow (our proprietary software), Quality execution and excellent customer service. We provide the training and assistance to port this model to our new franchisees' territories. Total Workflow, the industry's most advanced estimating and management system brings to each franchisee a tool that enhances estimator effectiveness, speaks to their business professionalism and provides invaluable information to help run their operations. It was developed by The Painting Pros specifically for the painting business and is constantly improved by our own in-house IT department and field tested by our own Area Managers. There are never any charges for updates. Those come as we work together and decide on cool new features to add. Never under bid a job. TWF calculates the job cost by the square foot or the item. It produces accurate estimates and contracts that can be signed by your customer's on-the-spot. Our franchisees close more sales with our Tablet PC based estimating system while their competition is passing out hand written estimates that are often inaccurate and unprofessional in appearance. Leads are fed directly into the online system by our 24/7 call center and assigned to your Area Managers. There are no additional costs for the call center and this keeps the franchisees costs down by not having office personnel. This allows our franchisees to track their customers and employees from the initial contact to the completed job, all on one integrated system. The powerful software system is both an internet and PC based application. The franchisee can access their Company's crucial information from any internet connected computer or take it with you on a laptop or tablet PC. That means that they are able to take vacations and still have a handle on their business. Everything is done inside an easy to use "drag and drop" graphical layout. It speeds up the training of new employees by eliminating the need for them to learn complicated pricing and estimating procedures. All of the franchisees data can be sorted and displayed in ways that allow you to see exactly how well the business is performing and what advertising sources are producing the most sales. We work closely with all of our franchisees to get them up and running successfully. We start out with two weeks of concentrated training for the owner in Charlotte, NC in all aspects of the business. Along with a complete set of manuals and CDs we provide consulting through bi-weekly conference calls with owners, monthly conference calls for their sales people and on going on call assistance from our operations support staff. We provide sales leads that are generated through our regional and national advertising campaigns which allows them to hit the ground running. We currently support over 400 stores for The Home Depot which means when you go into a Home Depot and want your house painted, we provide that service exclusively. This allows our franchisees to have a big box retail front in which they can generate leads and have immediate business. The Home Depot relationship is available in most areas of the country. I encourage new franchisees to not buy The Painting Pros franchise because of The Home Depot as it is a contract and could end at any time but it is a great way to add credibility to their business. Our large and exclusive territories are sized to more than adequately support the business. Our franchisees can create and grow a successful business and not feel cramped and limited.